Thought I write a few lines to update you with Noonbarra Kel. 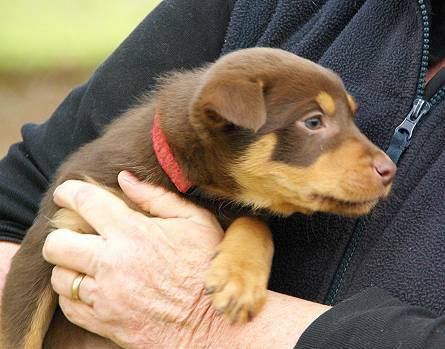 From the very beginning ( six month of age ) taking Kel to the “ learners “ sheeptrialing place at Clarendon, near Windsor, I was told by those in the know how, that I had an exceptional Kelpie. 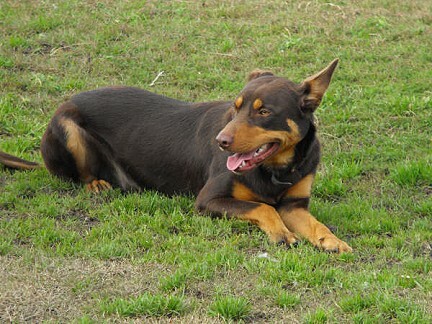 So much so, no word of a lie, I could then already sense a bit of jealousy from these “ experts “ who had a Kelpie or a Border Collie. Since then Kel as excelled in weekly training and private lessons and at 12 month of age he entered the first in house trial. My first run at the competition wasn’t very good, but I put in a much better performance in the second run. Suffice to say, Kel knew everything what he had to do, it was me who let him down. We got a score of 87 in the second run and where placed second overall. I have since been offered $ 4,000.00 for Kel, - but he is not for sale for any price! 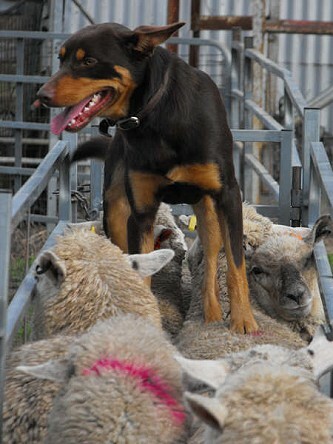 Kel is entered for the competition in Mudgee at the end of July 2009 and we really have great expectations of him. Kel is giving me and Jojie a lot of pleasure and we love him so dearly. He is of course a little spoiled, but that’s how we like to treat him. Kel has got a wonderful life with us. Please find current photos of Noonbarra “ KEL “ taken at the place where I do some private training once a week. Kel is going extra well with everything, though with the backing we have to do a little bit better. Also his going left is his week point, but otherwise we are extremely happy with him. As I mentioned to you, Anthony is training him for me at the moment, so he is getting used to him. We have entered Kel into a competition in Mudgee towards the end of the month and we really hope that he shows what he ahs got. 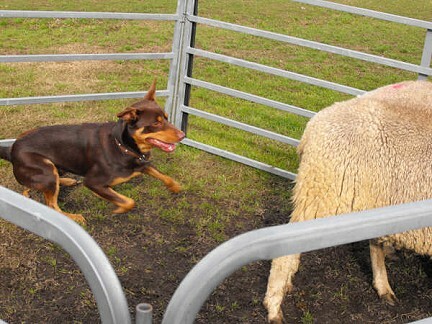 I was already warned about the judging and that those sheep a very different to the sheep we work with. Also the whole atmosphere may be a little worry for Kel, as this is his first real trial. 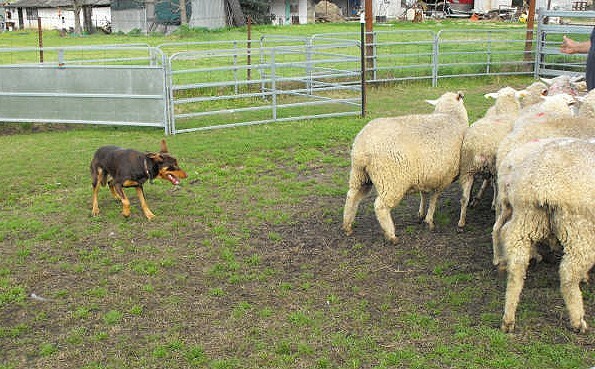 Well, we see how he performs, no one can predict how the dogs react on the day. We are definitely very excited with him and we love him so dearly, - he is definitely our baby. Probably we spoil him a little too much, - but we can’t help ourselves,- he such a gorgeous boy!!!!!!!! If the photos are good enough you may use any one of the photos for your web site. If the photos are not good enough, please let me know and I will send more later. Hope you are well Steven, I wish you all the best from the bottom of my heart. 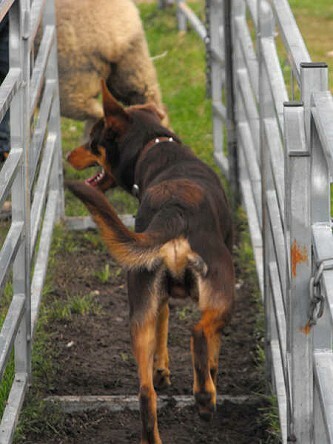 Just a couple of pictures of Reya in action in a small short course trial last month. Normally we have one ear down, but the photo with her in the down position was waiting for some sheep to be let out and when she is very curious then 2 ears are up! The last photo is both dogs with my husband Jake. As you can see, Reya needs to be on top of you and the closer dog! 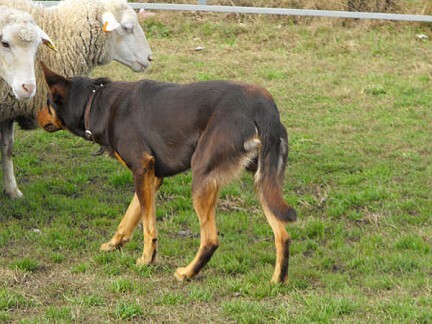 Although Reya is taller than Jez, Reya is not what I would call a tall kelpie she is more medium size. Jez is just small (comparing them in the photo). Jez is 480mm at the wither. Hope you are both well. I will be seeing Robert on the weekend 11 July at Uralla. I am hoping he will bring either or both Queen and King. I am also wanting to drill him on yard trial training!